The Ontario Christian girls soccer team (11-5-1, 8-0) earned the program’s 300th league victory following the 3-1 Ambassador League win over Linfield Christian on Jan. 22. During the 30 year existence of the program, the Knights have competed in four different leagues: Prep, Olympic, Christian and the Ambassador. 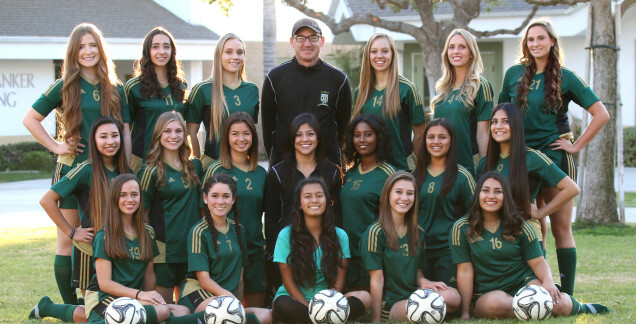 The success has led to 21 of 29 possible league championships, according to current soccer coach David Belden. Belden is in his 15th season as coach of the Knights and is fourth coach in the program’s history. During his tenure, the Knights have won 136 leagues games. Sydney Robinson, Alexis Cervantes and Taylor Mankin each scored a goal in the Knights’ eighth consecutive league win of the season. Madison Mouw contributed with two assists while goalkeeper Kristin Inge had three saves. AMBASSADOR LEAGUE >> Ontario Christian finished third in the team standings of the 2015 boys league championships 5k event. The Knights qualified for the CIF prelims following the top three finish. Jakob Eichor was the top finisher for the Knights following a second place finish with a time of 16 minutes, 18.2 seconds. CHINO HILLS 3, ST. LUCY’S 0 >> Kenzie Koerber had 19 kills for the Huskies in the victory over the Regents, 25-15, 25-13, 25-21. Alexis Cardoza contributed to the victory with 10 kills and seven digs while Courtney Buzzerio had 38 assists and two aces. The Huskies will compete in the Redondo Union Tournament on Friday and Saturday. Ashley Dimaculangan, St., Ontario Chr. From the voice mail, which didn’t make it in the paper or in the prep roundup. The Knights (1-1) were led to victory by Ashley Dimaculangan, who had 12 kills, while Taylor Holcomb had 23 digs, Alex Paez had five aces and 17 digs and Shaye Worley added six kills and 20 assists. Alyssa Ybanez, left, transferred from Rim of the World to Los Osos. It’s hard to imagine the Los Osos volleyball team getting much better, but that’s exactly what happened this offseason. The team that finished one win shy of the first CIF championship in school history gained two transfers, one of which helped lead her team to a CIF title last season. 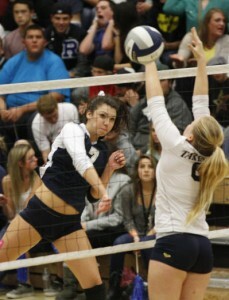 Alyssa Ybanez, the 2012 Mountain Valley League offensive MVP, transferred to Los Osos along with 6-foot-1 Aquinas middle blocker Delaney Goodrich. They will join a core of players at Los Osos including the reigning Daily Bulletin Player of the Year, Cal-bound senior Ashten Smith-Gooden and Ashley Kaylor, a first team All-Valley selection last season. The above video shows Robert Mendez scoring the winning run with two outs in the ninth inning on a wild pitch and a throwing error in Ontario Christian’s 2-1 Division 5 quarterfinal victory in nine innings on Friday. Due to heavy fog on Thursday at Rim of the World High School in Lake Arrowhead and the anticipation of more fog Friday, the CIF-SS East Valley championship football game has been moved to Citrus Valley High School, according to Ontario Christian athletic director David Parkes. No. 1 seed Ontario Christian will take on Rim of the World on Friday as scheduled at 7 p.m., just not in the mountains as originally planned.